Yesterday was the longest day ever. We left Johannesburg just after midnight, spent 10 hours flying over Africa the long way, got off in Amsterdam and ran around the Damrak and the tulip market for a few hours, got on the plane again for 7 hours, landed in Boston and drove up to New Hampshire. All in a single day. That capped a wonderful, intense 8 days in South Africa wrapped around the SchoolNet SA conference in Bloemfontein. Before the conference we were royally hosted by Gerald Roos in his Capetown home. 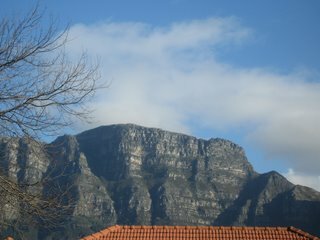 This photo taken by Alex shows the view of Table Mountain from our bedroom window. More details and photos to follow. For now, we're jetlaggy and getting ready for a keynote in Vermont. Such a vacation!